Sales role-play is a tool which can be used to decrease uncertainty of how a sales person is going to perform keeping in mind that working as a sales person can be very challenging. Two people practicing a sales scenario with one person being the sales person and the other being the prospect or customer is role-playing. There is likely a big amount of information that the sales person needs to embrace which is one reason that the environment or job of a sales person is challenging. There is usually a big number of details that we need to be fully up to speed on which include details around our products, our services, general company information, etc when working with prospects. We need to sound knowledgeable in all of these areas to educate our prospect to build interest as well as to have the ability to qualify and establish credibility. We need to be knowledgeable about our company and what we’re selling as well as be very knowledge about sales tactics, methodologies, processes, etc in order to consistent and effective. There is a very large amount of logic and philosophy which can be applied to improve results which is an additional layer of information and knowledge that a sales person must develop and manage regardless if there is formal training provided or not. We can begin to work through all of the information and knowledge which is needed to fully embrace to be successful by implementing sales role-play. Most positions provide some sort of sales training which will include tools such as presentations, videos, tests, etc. They’re all great tools because they help with establishing a baseline or entry-level of knowledge. We need to practice and work through all of this information to get us to the next to level, and that is exactly what role-playing helps with. Usually, a sales position comes with some sort of training which might occur when an employee is hired and/or recur as there are product changes or to simply improve sales skills. It can increase the return on investment greatly by adding some sort of sales role-play when this time and investment is being made. The act of practicing greatly increases the amount of absorption of the training information whether the opportunity exists to role-play during actual training or if it needs to be added informally after training is completed. A major portion of the training information will go in one ear and out the other which is a reasonable expectation and role-playing reduces this loss. Also, during sales coaching, role-playing can be powerful. Sales coaching is more informal than sales training so identifying when to use it and/or which topic to focus on won’t always be easy to understand. An opportunity could exist where a client is having a challenge or wanting to improve something and role-play is a tool which can be used in that scenario to help improve results. 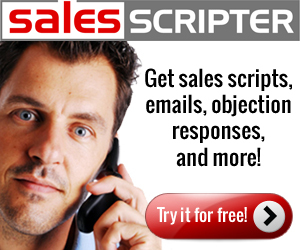 SalesScripter provides sales role-play software with call scripts helping companies to increase the level of role-play for their sales people.